CMR Sales, Inc., the exclusive suppler of Crest Ultrasonic Parts Cleaners to the bicycle industry, has been very busy since Interbike. First, the company introduced a new parts cleaner, the Crest BC1100HT. Next, it launched its website, www.bikecleaners.com. And third, CMR Sales has put together a payment plan for its top-end parts cleaner. The new Crest BC1100HT IBD, priced at $1,955, boasts numerous features IBDs have been asking for including two deep mesh baskets where the new style crank with chain rings can be submersed and cleaned, with the other parts all at once. The new Crest BC2600HT, twice the size of the BC1100HT, cleans and lubes simultaneously, thereby saving time, and comes complete with enough lube and cleaner to service dozens of bike parts. CMR Sales new three-month payment plan, now makes Crest's ultimate cleaning system  the BC3-575HT-CP  more affordable. 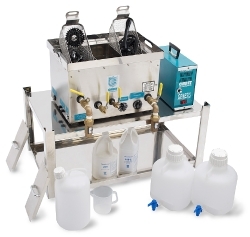 The system boasts loads of features including three chambers  two deep mesh baskets and one drip chamber  which means a higher volume of parts can be serviced; an adjustable heat and timer unit for more controlled cleaning; a variable power generator along with chamber covers; allows for recycling the lube and chemicals which saves money; and comes complete with two gallons of lubricant and one gallon of Crest's special water-based, bio-degradable cleaner. MSRP: $3,995, or around $1,300 a month for three months with CSR Sales payment plan (for qualified IBDs). You can check out the BC3-575HT-CP and other cleaning systems on CMR Sales, Inc.'s new website, www.bikecleaners.com. The site, while still under construction, includes information on the ultrasonic cleaning process, IBDs who are already using Crest cleaners, and a price and features list. "We continue to improve our products and service," says Greg Infante, President of CMR Sales, Inc., Crest's exclusive distributor to the bicycle industry. "Our new Crest BC1100HT is a great system for any IBD especially for those who clean a lot of cranks, and for those who want the ultimate system we can help out with the our three-payment plan." For more information, go to www.bikecleaners.com. To contact CMR Sales, Inc. call toll free: 1-877-254-7939 or email Greg Infante at greg@bikecleaners.com. CMR Sales Inc. is the exclusive distributor of the Crest Ultrasonic Firearm Clean & Lube Systems and Bike Parts Clean & Lube Systems for over 10 years.The company's president has over 14 years experience of ultrasonic cleaning in various industries. For more information go to www.bikecleaners.com. Since 1961 Crest Ultrasonics Corp. has been the leader in supplying ultrasonic cleaning systems to hundreds of industries from semi-conductors to automotive to bicycles. The company has been servicing the bicycle market for over 10 years. More information about Crest Ultrasonics Corp. can be obtained at www.crest-ultrasonics.com.